The members of the hotel association of Mecleodganj, Dharamshala and district association met the UD and TCP minister Sarveen Choudhary at Dharamshala late Yesterday.Secretary of the hotel association of Kangra , Sanjeev Gandhi while talking to PTI after this meet said, “ it was a very good meeting. The Govt has appointed expert Panel comprising of advocate and I AS officers for reviewing the town and country planning (TCP) Act and considering our demands such as revised Floor Area Restriction FAR(separate FAR for residential and Hotels and Commercial buildings) , increasing the limit of Building Heights .She also directed the officers of Municipal Corporation (MC) to clear the pending files of responses of the hotel owners for completion on priority. 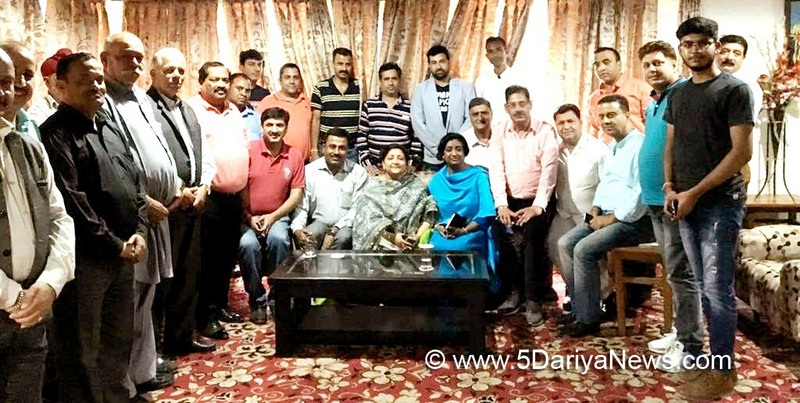 She has ensured next meeting at Dsala with TCP expert Panel and Hotel Association at Dharamsala. She also emphasized on indicting more staff in the MC office.”Gandhi further added that the height limit of the commercial buildings have been set (in new hotel policy of the state) , to 21 meters for those connect with 5 meter roads and 15 meters for those having only 3 meter roads. He said the width of the roads cannot be increased in this hill state , so how can hotel industry flourish and expand. He said, “For hotels in HP the FAR fixed for 1.7% whereas it is 3.5 in Delhi and 12to 15 in eurupe and USA and even in Japan which is highly prone to earth quakes, and one can buy it in Mumbai. It must be increased in HP to boost the tourism industry.”Gandhi said that the hotels provides free accommodation to its staff and the drivers of the tourists, it should not be counted in occupancy.Government spokes person said that the UD Minister listen the problems of the hoteliers and promised for consider them sympathetically. She has assured the association to have a one to one meeting with the concerned officials in Dharamshala soon.Over 160 hotels in Dharamshala areas have been sealed recently due to illegal constructions.Sharad and Alka Garg the frequent travellers of Mecleodganj said that if Himachal government doesn’t act quickly to reopen the closed hotels, the majority of the tourist rush will shift to Utterakhand, which could bring a big setback to tourist industry of HP.In a private survey conducted by an agency, this crisis has already reduced tourist inflow to 30% this session in the state.